The last incident was this year on April 14 when a resident of the border Berdavan village in Armenia’s Tavush province, Rafik Mughdusyan, 56, died and Haghtanak village resident Gabriel Babikyan, 49, was wounded in a landmine blast while they were collecting forage. 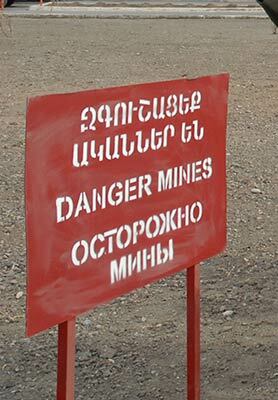 The Armenian Defense Ministry always calls on borderline region residents to be careful while agricultural works and to follow the warning signs placed in mined areas, however this doesn’t always help. Moreover, there are casualties because of landmines among the military as well. This year on March 31 while realizing a military task 27-years-old senior lieutenant Harutyun Safaryan was killed by a landmine on the line of contact in the Armenian-Azerbaijani conflict zone. Last year on October 16 on the northeastern border of Armenia while realizing a military task 26-years-old captain Gevorg Mnatsakanyan was killed by a landmine. His three military friends, senior lieutenant Garush Hambardzumyan, and soldier Narek Hakobyan and Edgar Harutyunyan were wounded. According to official data, since the establishment of the ceasefire regime in May 1994 more than 115 people have died and more than 300 have been wounded. According to the Defense Ministry, in Armenia 322 square kilometers are still mined – territories adjacent to around 60 residential areas. Currently, landmine clearance activities are being carried out in 16 confirmed mined areas of four communities of the Syunik province on the basis of technical task suggested by the Humanitarian Landmine Clearance and Expertise Center. Twenty-one deminers from HALO Trust international organization and Defense Ministry peacekeeping engineering battalion (with financial support of the US State Department) starting from April 1 for a year will endanger their lives for general safety. This is the first international and joint project. On May 3 in the Srashen community of Syunik province first deputy defense minister David Tonoyan and US Ambassador to Armenia John Heffern participated in the monitoring of mine-sweeping activities. They even manipulated the explosion of the first mine as a sign of effective cooperation. Due to similar annual works the possibility of such accidents decreases, as well as more land becomes arable for agriculture. The Swiss Foundation for Mine Action (FSD) with the support of the Humanitarian Landmine Clearance and Expertise Center has been collecting information about mined and dangerous areas in Armenia since 2012. As the most mined province, Syunik was the starting point, but work will continue in other four provinces as well. Still in late 2012 the head of the FSD Armenian office Johannes Odendaal attached importance to the initiative of forming database not only for the government, but also for the communities so that they are also aware of the endangered zones. Chinar village mayor Samvel Saghoyan told ArmeniaNow that in neighboring villages of the Berd area, Tavush province, for instance, they are aware of the endangered zones, and that is highly important in regards to safety. “Maybe an animal escapes and falls into those mined areas that are in buffered zones, but the borderline residents are mostly aware that it’s dangerous, and nobody would want to go and endanger their lives,” the village mayor said. “There are signs all along the border, people know that there are mines 300-400 meters from there, so they are cautious,” he added.